October 6, 2016 - John Holcomb, MD, FACS, has been named the recipient of the 9th Annual Major Johnathan Letterman Medical Excellence Award. The award selection committee selected Dr. Holcomb for "commitment to improving patient outcomes through innovation and unrelenting dedication throughout [his] career truly reflect the spirit of Major Jonathan Letterman- the 'Father of Battlefield Medicine.'" The award will be presented on October 6, 2016 in Dickerson, Maryland. The Major Johnathan Letterman Medical Excellence Award was established by the National Museum of Civil War Medicine to celebrate Letterman's work as Medical Director of the Army of the Potomac during the Civil War. During the battles of South Mountain and Antietam, Letterman fine-tuned what is now known as the Letterman Plan, which saved the lives of countless Civil War soldiers and continues to save lives on today's battlefields. June 18, 2014 - The Center for Translational Injury Research (CeTIR) was established by funds provided, in part, by the State of Texas Emerging Technology Fund. The goal of CeTIR is to lead research and development of next-generation medical technologies in the areas of hemostasis, resuscitation and computerized decision support for trauma patients. The advancements and achievements of CeTIR and the Center’s Director, Dr. John Holcomb, was recently highlighted by the Office of the Governor. Check out the CeTIR Case Study on the Emerging Technology Fund website. To learn more about CeTIR’s mission and capabilities check out the About Us page. For more information about our projects, visit the Research page. University of Arkansas's College of Medicine with the 2013 Dean's Distinguished Alumnus Award. Dr. Holcomb earned is medical degree from the University of Arkansas in 1985, and was honored for his outstanding service and contributions to the field of trauma care. The award was presented to Dr. Holcomb by the school's Chancellor, Dr. Dan Rahn, during the College's alumni weekend held in Little Rock. March 17, 2014 - Hemorrhage remains a leading cause of early death in both civilian trauma and military combat casualty care. The transfusion of whole blood for trauma induced coagulopathy is not routinely done in civilian practice, but US military physicians have used fresh whole blood in every combat operation since the practice was introduced in World War I. So which is superior, whole blood or component therapy, or are they the same? CeTIR investigators, led by Dr. Bryan Cotton, conducted a randomized controlled pilot trial to begin to answer this question. A total of 107 patients were randomized over a 14 month period. With no differences in baseline demographics or injury severity, 55 patients were randomized into the whole blood group and 52 were randomized to component therapy. Compared to component therapy, whole blood did not reduce transfusion volume requirements in these injured patients and there were no differences in 24-hour and 30-day mortality between the two groups. However, the use of whole blood significantly reduced transfusion volumes in patients without severe brain injuries. The study results were published in the October issue of Annals of Surgery. September 16, 2013 - Sepsis accounts for nearly 200,000 deaths each year in the US. To increase public awareness of this globally common deadly disease, the Global Sepsis Alliance with their founding non-profit organizations created September 13th as World Sepsis Day. In honor of this day, the University of Texas MD Anderson Cancer Center’s Sepsis Collaborative held a community event that included informational exhibits, posters, and provided educational material on sepsis. One of CeTIR’s summer research students, Corbin Goerlich, presented a poster at this year event where he won the clinical poster competition. Mr. Goerlich, along with his primary mentor, CeTIR’s Dr. Laura Moore, conducted a prospective observational study to validate the use of a sepsis screening tool in emergency department patients utilizing StO2 measurements. The purpose of this study was to develop a screening tool for early identification of sepsis in the emergency department using readily available triage data. Early identification can lead to earlier treatment and reduced rates of morbidity and mortality. Visit the World Sepsis Day and Sepsis Collaborative websites for more information on sepsis. June 20, 2013 – Last week, the JETT was used for the first time to save the life of a Houston civilian. CeTIR investigators Drs. John Holcomb and Keith Gates developed the Junctional Emergency Treatment Tool, also known as the JETT, to serve as a junctional hemorrhage control device for wounds too proximal for traditional tourniquet use. This novel device is light-weight, portable and can be used to treat pelvic and lower extremity injuries sustained not only on the battlefield, but in the civilian environment as well. The JETT is already in use in Afghanistan. Life Flight paramedics used the device for the first time last week to save the life of a Houston man who sustained an injury from a circular saw to one of his large arteries. 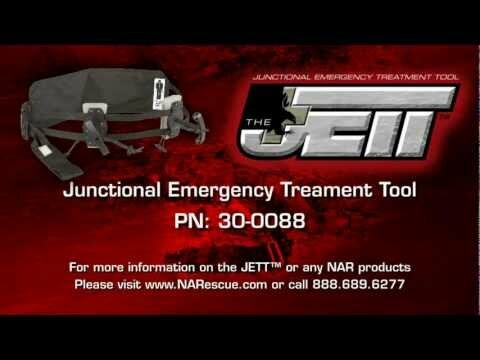 To learn more about the JETT check out the video below from North American Rescue and the featured article in the Houston Chronicle.